File this under “Behaviors have consequences”. In April 2015, encouraged by their black mayor, Baltimore — a majority-black city of roughly 623,000 — erupted into race riots over the death-in-police-custody of Freddie Gray. The riots’ aftermath was a state of anarchy in Baltimore — in which homicides spiked, police presence was scarce, and residents lived in fear, especially in black neighborhoods. For that matter, the crime spike was not just in Baltimore and Ferguson, but nationwide. In November 2015, 7 months after the riots, the city admitted a 78% increase in homicides over the same period in 2014, which is more than 100 additional deaths. The surge in killings can be pinpointed to have begun after the riots. Some say police have deliberately pulled back from poor, black neighbourhoods, a theory that the police disputes. Others blame an influx of drugs from pharmacies looted during the April riots. A third theory is that a decline in trust between the police and the policed has had deadly consequences: fewer residents talk to the police, which leads to fewer murders being solved, which—by lowering the odds of being caught—results in more murders. Whatever the reason, the killing is continuing. 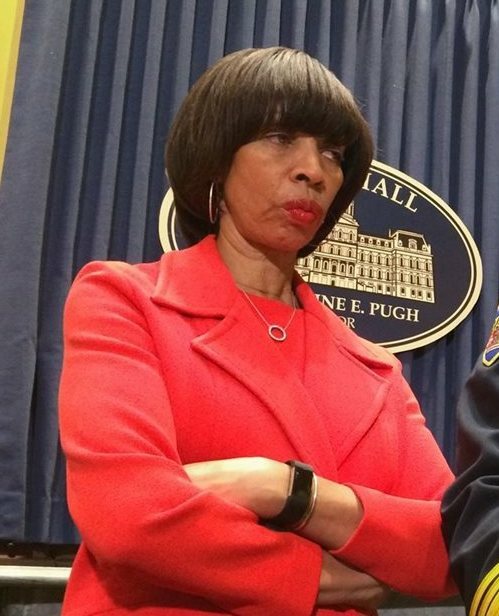 WJZ CBS Baltimore reports, April 28, 2017, that Baltimore Mayor Catherine Pugh declared the city’s murder rate is out of control. Violence in Baltimore has reached a crisis level of 100 murders before the end of April — the first time that’s happened in 20 years since 1998. Pugh met with the special agent in charge of the Baltimore division of the FBI, but wouldn’t provide specifics. She says they’ll come out next week, and the FBI isn’t talking. President Trump has advocated sending in feds to stem violence in Chicago and other cities. The FBI has 56 field offices nationwide and provides assistance in gang and drug cases. The Bureau had helped during the 2015 riots in Baltimore, by using a video-equipped surveillance plane to monitor lawbreakers — which alarmed privacy advocates. In May 2015, Freddie Gray’s death was ruled a homicide. 6 Baltimore cops, including 3 blacks, were taken into custody. Caesar R. Goodson Jr., the police officer with the most serious charge — that of depraved heart murder — is black. So much for gun control . . . .